She had grown up watching women get pregnant and giving birth, fantasizing about when she would do the same. She had probably even helped change the diapers of some relatives’ babies on occasion. She got married and couldn’t wait to have a baby. But she didn’t. As the months passed, the questions started coming. Aunts were all too willing to give their unsolicited advice on ‘successful baby-making’. At first it was amusing, until it became frustrating. The months turned to years. Her friends’ babies grew into adults, got married, and were having their own babies already. The questions dwindled, soon replaced by whispers. Soon those whispers were replaced by silent furtive glances. Everywhere she went, she could feel them. Sure, the people respected her, but it was the things they didn’t say, the things she knew they were thinking, that stung the most. She was the barren old woman from down the street. Barren. A name she had never thought would be hers. God knows how many times she prayed. Were they being punished for their sins? Her husband was a priest, and she was a direct descendant of Aaron, the first high priest. That alone should have given them points before the Lord, but still no babies came. Was God hearing her? Was He even there? Questions she didn’t dare put to speech. After years of agony and sadness, she settled for what they had. After all, His ways and thoughts were higher than theirs. They served God faithfully still. It’s not that she had forgotten she had a womb, it’s just that she had not needed it or even had a reminder of its presence in over a decade! But this was new. This was…different. What would she do? How would she live, taking care of her silent husband and nursing a pregnancy? How could she, a post-post-menopausal woman, move around town with the prominent bump leading the way, an embarrassing reminder that she was carrying something that was not for people her age? She felt ashamed. The rumours would only reach a fever pitch. She couldn’t dare go out again. For Zacharias it was a son, but for her it was personal. She carried the pregnancy. God had done something in her body. Her own body. It was a miracle. For a long time, miracles were just the stuff from the Scriptures. Like the Lord parting the Red Sea, or stopping time for Joshua’s armies to prevail, or making Aaron’s dead rod bloom. They were the stories she loved hearing as a young girl. But now, a miracle had been wrought in her own life – in her own body. The Lord had chosen her. Elisabeth’s story is a picture of what Israel was going through. Their history was full of accounts of God’s miraculous intervention time and again. But for the past 400 years or more, precious little had occurred beyond the ordinary. Reality overshadowed them as foreign nation after foreign nation invaded and took over their land. Even the prophets seemed an order of the past, so there was little if any hint of divine intervention. Where was the arm of the Lord? For many, even if they did not admit it, the miracles were a thing of the past. Those historical accounts were little more than myths to some. God and His ways were probably just a coping mechanism, just in case. Still, Israel felt abandoned. But God had not forgotten them. He was coming to them, and He was coming in a BIG way, in a way that would be so grand it would be embarrassing. I’m just kidding. He asks her to marry him, while everyone stands in awe, literally going, “Aw…” The lady wipes a tear. (Hey, was the ring an onion ring?) You get the picture. He is with the love of his life, and it doesn’t matter what anyone thinks. He will ‘spoil’ her with enough to make up for the lost years, and enough to set up their new life together. Enough to show her his boundless love for her and his delight in her. This was God’s promise to Israel. He’d said, through His prophets, that He would not only save them from their enemies, but would also lavish them with His goodness, would give them a great kingdom with a great king, so that all the world would see His faithfulness. And He came to save, not only Israel but all the world, totally overshooting the ‘save-them-from-their-enemies’ bit, giving a new life and an inheritance to all who receive His salvation, making them part of His endless kingdom, where He is King. He is awesome like that, always doing exceeding abundantly above all we could ask or think. He saves to the uttermost. That’s the big picture, and I’ve not even come close to describing it. But Elisabeth’s story shows us something even extra special. “God has come, for ME.” The blessing of God, in the form of her son, was a flashing neon sign to everyone around that God had done something supercalifragilisticexpialidociously AWESOME in the life a woman well past her prime. Everyone knew her as Barren. Now she was Fruitful. God had visited her life and left His fingerprint for all to see. It’s the gift of God being with us, among us, in us, coming into our very situation and changing it with the peace and blessing of His very presence. Immanuel. God in the life of a person changes everything, setting things right. It’s what He did in salvation. It is a blessing upon many, and a blessing upon each one that receives Him. A blessing upon you. That men will see His awesomeness in you as well. It’s what He can do in your life. If you’re His child you are so much more set up for His hand to work wonders in your life. And He does. Though our lives may seem to define ordinary, He has set things in motion on your behalf. Sometimes we don’t think we see His miracles because they don’t all seem spectacular. How wrong we are. I think it was Max Lucado that wrote, “A coincidence is a miracle where God chooses to stay anonymous.” You walk into a building and the first person you meet gives you the information you need to avoid unnecessary stress. You feel a prompting to take a certain route on your way home from a stressful workday, and on that route you meet an old friend whose presence lifts your spirits. Sometimes miracles are like that. Some miracles are a little more direct. Let’s go back to Elisabeth for a moment. Remember she’s expecting a baby and supporting her mute husband. She’s going to need a lot of help. So what does God do? He’s set up Mary, her younger cousin, to come down all the way from the other end of the country to visit her (Luke 1:36-40). 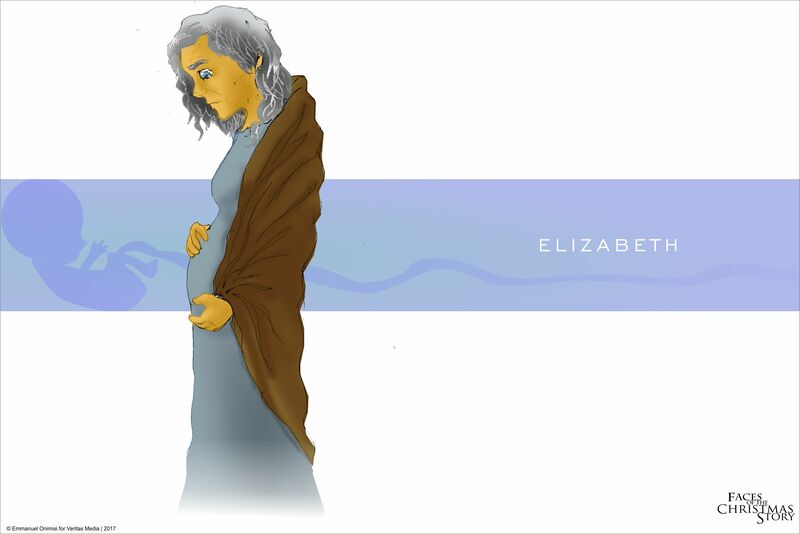 Mary stayed there until the Elizabeth’s baby was born. Many times, just like this, God uses people to help us. He may use someone to call you with words of encouragement at a moment when you’re feeling down. Someone else may be ready to mess up your day with an annoying Whatsapp chain message, but that person is suddenly distracted by joy at the news of his daughter finally gaining admission to the university of her choice. Wheels within wheels, God is working miracles just beyond our sight. He may even use you in the working of a miracle in someone else’s life. He did that with Elisabeth. Mary had just been told that she too would have a baby that would be the Son of God. The young lady was still going over the ramifications of this when she entered Elisabeth’s house. Suddenly, the baby in Elisabeth’s belly leaped and she, suddenly spoke words that confirmed what Mary had heard from the angel, further establishing her confidence in God’s promises. God used them both to encourage and build each other’s faith. That’s His desire, to use us to bless one another. But first, like He placed the babies in the women’s wombs, He must give you His kind of heart. That is the kind of person He can use to do His will and be blessing. That’s what Jesus’ coming was all about, to make you that kind of person. And, yes, God does overt miracles too, through the hands of His children. You can be used of God to heal the sick, cast out devils, and even raise the dead. These are the qualities He’s promised to all who believe in Him and His work of salvation (Mark 16:15-18). If you are Christ’s, this is your nature and ability. It’s all His gift to you. There is so much more we can learn from Elisabeth’s story, but I’ve kept you here long enough. It was not an accident that the writer of the Biblical account told her story together with her husband’s, Zacharias (spoiler alert: he gains his speech back in the end). While Elisabeth’s story shows us that God can do great miracles, even the impossible, in our lives, Zacharias’ story teaches us about faith in God, even in what looks impossible. Needs are a very common part of the human experience, both those that can be met and those that are a bit harder to meet. In all things, let your faith be in God, and you will see His hand at work in your life. Don’t let your heart get weary. Miracles are not alien to God’s children. After all, they are our Father’s specialty. May you grow stronger in faith, established in the knowledge of His faithfulness in Jesus’ Name.